Condos El Palmar are a set of 4 luxury penthouse condominiums located in Mexico's beautiful Costalegre region of Jalisco. All 4 apartments have fantastic views of Bahia de Navidad, its tranquil blue waters, and spectacular sunsets. Each condo has its own individual balcony on which you can sit, relax and enjoy the sunsets of the Pacific coast of Mexico. Extensive Tonala tiling throughout, plate glass doors to showers, all stainless steel appliances and where possible on all fixtures and fittings. Doors are all made from solid wood and the washbasins are the traditional Talvera style also handmade in Tonala. The units all have individual utility laundry rooms with washer/ dryers. Each unit has its own hot water boiler. All condos will come with air conditioning units. Users and owners of the condominiums also have access to the common areas which include, a swimming pool, sun loungers and a bbq and eating area, all in the relaxed, secure, private grounds of El Palmar resort. El Palmar luxury penthouse condominiums are the chance to own a luxury condo property in Mexico. You will be investing in what is an established area with a long and trusted track record. The resort is completed and ready for occupation and is not one of the many 'speculative investment properties' that can be found throughout Mexico. Each condominium comes with 'Titulo condominio', a legal title, it is acceptable for bank transactions. 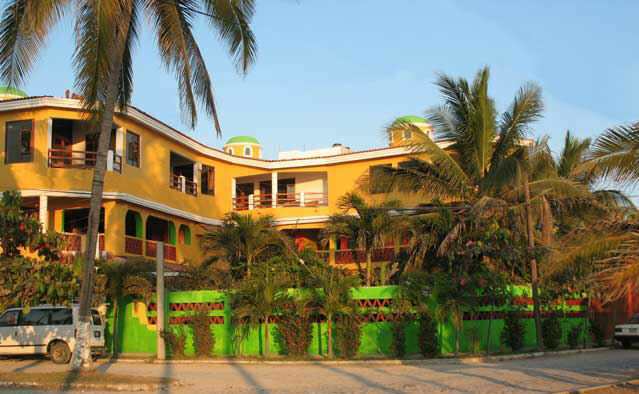 El Palmar is a boutique resort with an established rental clientel. New owners can participate in the rental pool. Foreigners can own property through a "fideicomiso" or bank trust. Under this arrangement, a Mexican Bank holds naked legal title to the property and the buyer as beneficiary receives all of the rights of ownership. The initial term of 50 years is renewable indefinitely. Property may be used, improved, rented, willed or sold. One of the advantages of trust ownership is the ability to appoint a substitute beneficiary allowing the title to transfer upon death without probate or payment of a transfer tax. This trust arrangement allows for foreign ownership while leaving the Mexican Constitution intact. This page has been visited times since February 7, 2009.